If I tell you that. although I did read the first two Harry Potter books, I stopped when I saw how fat volume three was, and have subsequently fallen asleep near the beginning of at least two of the films (possibly three, as I’m not sure if one was a repeat), then you’d be reasonable in assuming that I’m not really the target audience for Potted Potter. You’re right, but I know a girl who is. Which is why we were at the Garrick Theatre just after four on a Wednesday afternoon, along with hundreds of small children and their accompanying adults, and more curiously, and perhaps a little disturbingly, some adults who had come without an accompanying child. The show is a two handed romp through all seven books of the Harry Potter series, although if, like me, you’re broadly ignorant of the plots, you’ll emerge none the wiser. Instead, the books are used as a wonky framework for some comedic silliness, dressing up in cheap wigs and slapstick humour for the children and the childlike, with some clever back-chat, cinematic and literary references for the adults, and audience participation for everyone. I am generally immune to comedy; that slick ‘look how funny I am, I’ve analysed it, deconstructed and rehearsed this to within an inch of its life and it’s therefore funny so you’d better laugh’ stuff, does nothing for me other than irritate. And there are some aspects of that in this show, when Dan and Jeff, the performers, look like nothing so much as over eager puppies bouncing around on the stage. But what I did like was their willingness to take the risk that their gags involving audience participation wouldn’t go exactly as they had planned; that they were confident and sharp witted enough to deal with whatever happened and make it funny. It was those unscripted moments which were genuinely amusing. In a game of Quidditch, involving a couple of cardboard hoops lowered from the Circle balcony, a Globe beachball, two volunteers from the audience, and Jeff dressed in shiny nylon yellow as the snitch, there is quite a lot of risk, but during the performance I saw, a great comedy payoff. Seeing Jeff flattened by a proper rugby tackle around the knees by a little girl in glasses was funny for its spontaneity and surprise, as well as for the subsequent improvisation and ad libbing that came from it. Simon Gray’s 1981 play is set in the shabby staff room of a small language school in Cambridge, some time in the 1960s, or at least in an era when the casual national stereotyping of the Japanese and German students by their teachers was an integral part of break time chat. Each of the characters is disappointed, and nearly going over the edge as a result of the various travails of their lives, a troublesome teenage daughter, a severely ill mother, an unfaithful husband, being prone to a tiresome number of minor accidents. We hear about the lives off stage without ever seeing any of the other characters; indeed the joint headmaster, the maker of difficult decisions is also never seen, even if much of the dialogue is about what his reaction to this or that might be. And at the centre of the play sits Quatermaine, by everyone’s acknowledgement not a very good teacher, forgetful and absent minded, a fixture, but also a void. Apparently liked by all his colleagues, given his extreme passivity one can only assume they are projecting virtues on to his personality to make up for the amiable blankness they see there. It’s an interesting structure around which to build a play, lives of quiet desperation recounted either purposefully or obliquely through the conversations in the staff room, with a central protagonist who does virtually nothing but sit in a scruffy leather arm-chair and agree with everything that is said. Richard Eyre’s production plays it straight: a traditional set of sofas, wooden lockers and French windows, on which the curtain falls at the end of each Act. He has cast Rowan Atkinson as Quatermaine, a decision which has drawn in the crowds, and some fairly generous reviews in the newspapers. But, unfortunately, none of these features meant that the play engaged me on any level at all. Instead, it felt interminable; each time the curtain fell at the end of a scene, my heart sank, as it meant there had to be yet another one to come. You already know that I’m a notoriously bad judge of comedy, so it may not be helpful if I say that one line did make me smile. (The rest of the audience appeared to find additional things to laugh at.) But equally I felt little sympathy with the bathos of the ending. The perception of the success of the casting of Atkinson, known for his rubber face and body physicality in such a static role, will depend on your liking or not of the actor, as to my eye he played the same character of ticks, pursed lips and wild eyebrow movements that he always does, just this time sitting down. Given the indulgent applause he received at the curtain call, I think mine may be a minority opinion. 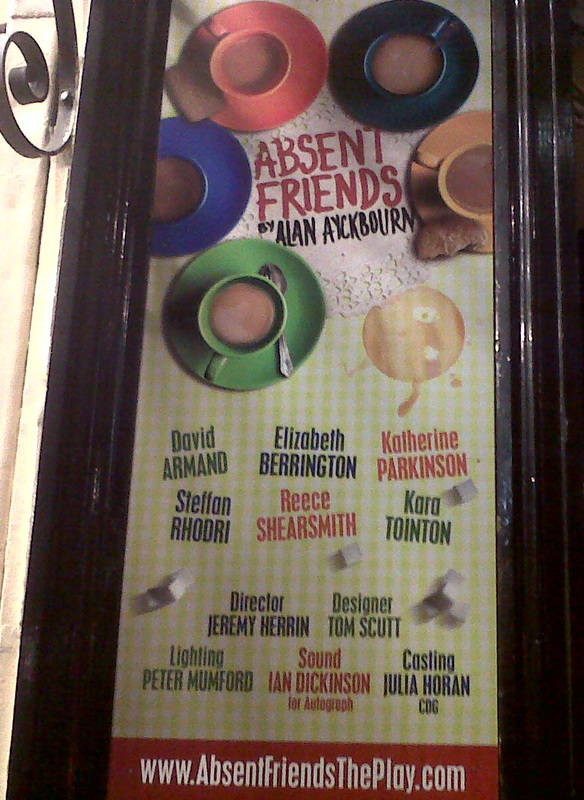 I think the best thing I can say about ‘Absent Friends’ by Alan Ayckbourn is that the two Dutch people sitting next to me in the theatre seemed to be enjoying it, chuckling and snorting along and making our shared row of seats shake with their mirth during the performance. As for me, not a single moment, line, gesture or look managed to raise so much as a silent smile, let alone anything approaching laughter. I’ve written before about how difficult I find ‘Comedy’, so I’m not the best indicator for the success or otherwise of something predicated on the assumption that the audience is meant to find it funny, but having said that, I think the two friends with whom I went, were also decidedly underwhelmed on the evening. The play, first performed in the early 1970s, is set during an awkward tea party, arranged to reunite a group of friends in support of a person they have not seen for a number of years, but who has been recently bereaved. So we’re set up with a potentially bleak subject matter, a group of people who won’t say what is really on their minds, a suspected infidelity, a person who can’t speak but to put their foot in their mouth, a baby in a pram, and one man desperate to make a sale to his more successful ‘friend’, who has probably been sleeping with his wife. Predictably, it all turns very awkward, shouty, a bit slap sticky with a generous dollop of running in and out of the kitchen or up and downstairs, and someone being doused with a jug of cream originally intended to go with the trifle. If these elements are likely to amuse you, then the play may be for you. Meanwhile, I sat wondering if they were original copies of Woman and Woman’s Own that Kara Tointon, as Evelyn, was reading, or if they’d been mocked up for the show; and whether having to ostentatiously chew gum for the entire running time might not be giving her wind. The set was a careful recreation of a certain kind of 1970s aspirational décor, examination of which kept me occupied for part of the first half, but after the interval, I resorted to studying the stucco decoration of the theatre itself, my only sympathy with the play’s action being with the character Diana, who had to keep running off stage in tears. Stand-Up Comedy – Will It Ever Make Me Laugh? Before Christmas I watched a two part Imagine programme about Stand-Up comedy. Now, those of you who know me may wonder why I would spend any time on comedy, as I generally don’t find it amusing. But that is the very reason why I did watch. The majority of orchestrated comedy, stand-up and sit-com, usually has a broadly negative impact on me; not only does it rarely make me laugh, it actively irritates me. But I have witnessed, on many occasions, in cinemas, theatres, and other people’s sitting rooms, that other people do find such things funny, are even attracted by reviews that mention rolling around in the aisle or crying with helpless laughter. Usually when I say that I don’t like comedy, my interlocutor will tell me that I must try this or that show, performer or act, because they are ‘really funny’. I nod and smile ‘Oh really?’ just to be polite. It is such a question of personal taste, and yet, the fact that some performers attract large crowds and make lots of money, interests me. It’s unlikely to make me crack a smile, but it is nevertheless a cultural phenomenon that I’d like to understand better. Watching the Imagine shows was, however, a surprisingly gloomy experience: talking heads, popular stand up comedians seriously analysing what it is they think they’re doing, how they calculate the content and performance of their shows, and how long it has taken them to develop their particular shtick. Interspersed with the interviews were filmed extracts from their shows, presumably illustrating the points they had just made; all of them uniformly, to my eye and ear, entirely unfunny. I can see that some of them are clever, but there was nothing in it to make me laugh. It seemed such a shame that they put in so much effort to so little effect on me. There were however many parallels between the way the comics described how they generated their material and their stage persona to what any writer takes into account in their own work; to take small details of life and to exaggerate, to riff, to change, to improve and then to deliver it in their own individual authentic voice. A couple commented that early in their careers they had been told their material was clever but that they had not found yet the right voice in which to deliver it. I’m still puzzling about why I am so put off by stand-up comedy. Some of it is the shoutiness of so many of them, and the pausing for effect, the craven begging that they be found funny, the laughing at their own jokes, the ‘trying so hard’-ness of it all. I do however quite enjoy the silly panel shows that are often on television, where the quick witted repartee does amuse me. Yet it is often the same performers who are on these shows, who, on their own doing the ‘Hello, Swansea’ type shows, will always make me operate the off switch on the TV and radio. So if there is a joke, I’m still not in on it.